Tourists at the gorge overlook in Taughannock Falls State Park near Ithaca, New York on Saturday, August 4, 2018. Nikon D750/24-120VR, 1/125s, f/16, ISO 2200, EV 0, 70mm Focal Length. I normally visit Taughannock Falls State Park near Ithaca, New York very early in the morning and avoid the summer crowds. Not the case last weekend as I wanted to get ready for an upcoming trip which will have crowds of tourists. This allowed me to incorporate people into my photos which does a couple of things. One, it helps show the size and scale of the park’s waterfalls and gorge in comparison to people. Two, to enjoy this natural wonder with other people from all over the world was fun as I watched and listened to their reactions to the Great Fall in the Woods. Tourists reading an informational plaque next to Lower Taughannock Falls at Taughannock Falls State Park near Ithaca, New York on Saturday, August 4, 2018. Nikon D750/24-120VR, 1/125s, f/16, ISO 320, EV 0, 85mm Focal Length. Over the last couple of years, New York State Parks Department has done a lot of maintenance and added many needed touches to the the parks. 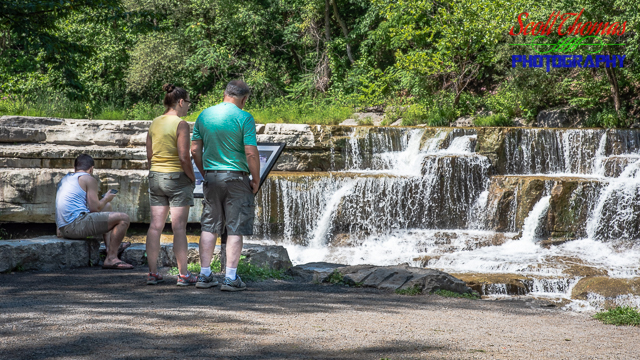 Taughannock Falls State Park now has more informational plaques where people learn about the history of the park and the Cayuga Lake area along with the natural landscapes of the gorge, waterfalls, wildlife and how they came to be. Tourists walking on the gorge trail at Taughannock Falls State Park near Ithaca, New York on Saturday, August 4, 2018. Nikon D750/24-120VR, 1/125s, f/16, ISO 4000, EV 0, 24mm Focal Length. 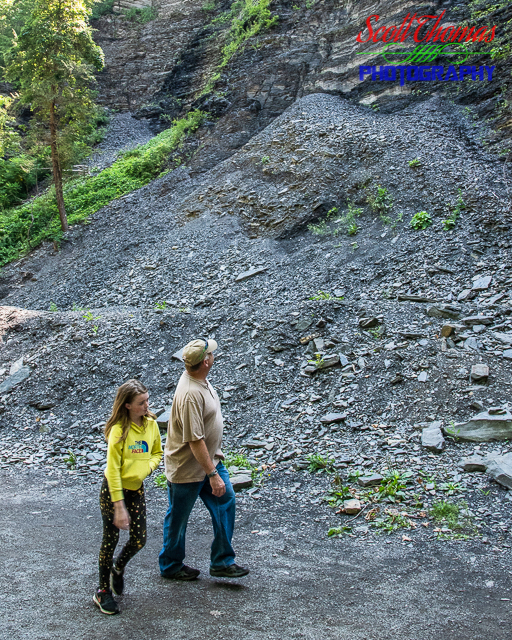 Back in the Spring of 2016, a large landslide had blocked the Taughannock Falls Gorge Trail. It took the NYS Parks Department a few months to get the trail open again. Over the course of the last two years, the trail has now been completely cleared leaving behind a large talus of small rocks and debris from the slide next to the trail. People walking by would look at it and wonder how it got there. Tourists on the lookout platform at the end of the Gorge Trail in Taughannock Falls State Park near Ithaca, New York on Saturday, August 4, 2018. Nikon D750/16-35VR, 1/25s, f/16, ISO 100, EV 0, 24mm Focal Length, Skylum Intensify CK. At the end of the Gorge Trail is the large lookout platform to get as close as New York State wants people to go. If you look closely, you will see some people decided to get a bit closer. When the falls have a very heavy flow, the area gets very wet from spray. 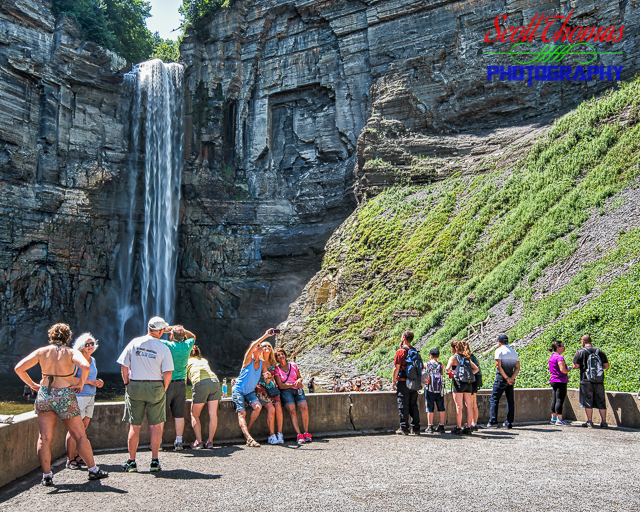 With a nice midsummer flow due to rainfall over the previous couple of weeks and a hot, summer Sun, the platform was nice and dry allowing people to enjoy the 215 foot (65.5 meters) drop of Taughannock Falls. If all goes according to plan, I will have a post up next Monday but it could be delayed a day or two depending on weather conditions. I will be posting about the adventure on my Twitter account which you can follow here by clicking this link: @sthomasphotos. 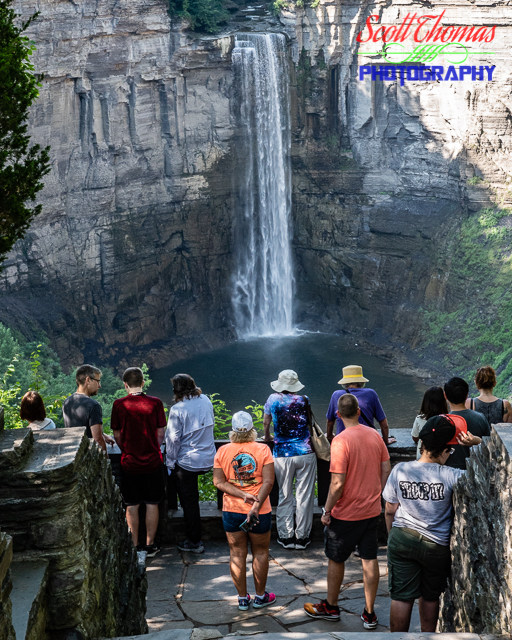 This entry was posted in Nature, People, Weekly View and tagged 24-120mm, gorge, lookout, lower, new york, nikon D750, overlook, state park, summer, taughannock falls, tourists, trail, tripod, vr, water, waterfall, wide angle. Bookmark the permalink.